The dead and wounded were transferred to Al-Alfi military hospital and Al-Thawra hospital in the Huthi-controlled city of Hodeida. 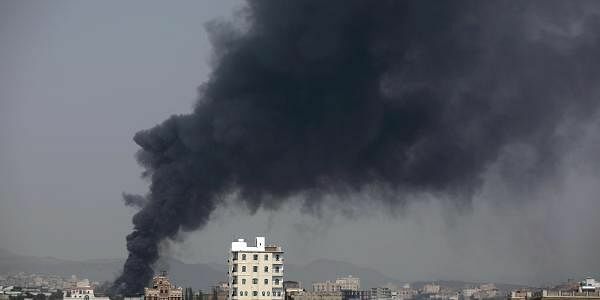 ADEN: Sixteen rebels have been killed and 24 wounded in 24 hours of air raids by a Saudi-led coalition targeting the insurgents in Yemen, a military official and medics said Saturday. The Huthi rebels were killed in air strikes on an air base and arms depot in the east of the rebel-held Hodeida province since Friday, the official said. A source in the coalition supporting President Abedrabbo Mansour Hadi's government said Hodeida was one of the areas being targeted since Friday as part of ongoing military operations on areas under rebel control. The dead and wounded were transferred to Al-Alfi military hospital and Al-Thawra hospital in the Huthi-controlled city of Hodeida, medics at the hospitals said. The Red Sea port city is a key transit point for desperately needed imports into war-torn Yemen, where fighting has escalated since the March 2015 military intervention of the coalition against the Shiite rebels. A boat carrying refugees was hit by an air strike earlier this month off the Hodeida port. Forty-two people were killed, most of them Somali refugees. The coalition denied accusations it was involved in the attack and called on the United Nations to supervise the Hodeida port. The UN has rejected the request on the grounds that parties involved in the Yemen war have a responsibility to protect civilians. Yemen's conflict has steadily worsened since 2011, after protests led to the resignation of then president Ali Abdullah Saleh. Saleh is now allied with the Iran-backed Huthis, who control strategic points along the Red Sea coast and the capital Sanaa. More than 7,700 people have been killed and 40,000 wounded since March 2015, according to the United Nations.